n a study titled "Prevalence of Periodontis in Adults in the United States: 2009 and 2010," lead author Paul Eke, Centers for Disease Control and Prevention, estimates the prevalence, severity and extent of periodontitis in the adult U.S population using data from the 2009 and 2010 National Health and Nutrition Examination Survey (NHANES) cycle. The study is published in the Journal of Dental Research, the official publication of the International and American Associations for Dental Research (IADR/AADR). Estimates were derived from a sample of 3,742 adults 30 years and older with one or more natural teeth of the civilian non-institutionalized population. Attachment loss and probing depth were measured at six sites per tooth on all teeth (except the third molars). The study is important because it is the first national probability sample that has employed a full-mouth periodontal examination protocol versus previous partial mouth examinations. Of the sample presented, 47.2 percent, representing 64.7 million adults, had periodontitis distributed as 8.7 percent, 30.0 percent and 8.5 percent with mild, moderate and severe periodontitis respectively. For adults 65 years and older, 64 percent had either moderate or severe periodontitis. These estimates are far higher than previous national estimates. 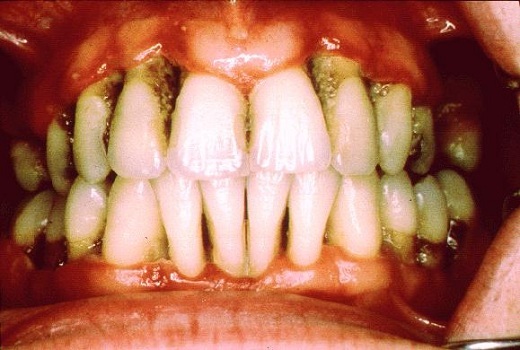 Periodontitis was highest in males, Mexican Americans, adults with less than high school education, adults below 100% Federal Poverty Levels, and current smokers. This survey has provided direct evidence for a high burden of periodontitis in the adult U.S. population, especially among adults 65 and older. Dr. Arlo D. Nansel has called it a day after 65 years of dental practice, and the Montana Dental Association says he’s the longest practicing dentist in the state’s history. He joins an ever-increasing fraternity of dentists who have held membership in the ADA for 65 consecutive years. In the history of tripartite record-keeping, about 1,600 dentists have accomplished the feat. Dr. Nansel, 88, opened his practice in Miles City in 1947. Throughout his career, he also served as president of the Montana Board of Dental Examiners and on the state board of health. Four years of litigation has ended with a one-day trial: A jury says Michigan prison officials are not responsible for an inmate's dental problems. Jurors returned the verdict Monday in Marquette federal court. Jerry Flanory claims he lost a tooth in 2006 and suffered gum disease because he was denied toothpaste as a punishment for not attending prison classes. But the Corrections Department had evidence that Flanory's bad tooth wasn't a new problem. He had only five of the typical 32 teeth when he entered prison. Officials said he had access to toothpaste. A Charlotte man has been charged after falsely claiming he hurt his teeth when a rock was served in his restaurant salad, the N.C. Department of Insurance said Monday. Robert Chase Garcia, 28, made the claim on Sept. 6 and submitted a $471 dental bill to the Village Tavern Restaurant. State officials said the claim was denied after they learned Garcia had a history of similar complaints against other restaurants.